“Alice has gained in self-confidence and self-control. "Zachary and I needed something to do during winter months. So when I learned of Anke King and her beginning Nose Work class I signed us up. 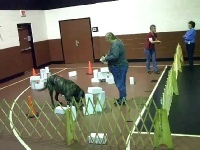 Zachary can be an anxious dog, but he took to Anke and her nose work class right from the start, sniffing his way through the maze and wagging his tail when he found treasure in the box. We signed up for Nose Work II." Once again, thank you so very much for the attention you have shown Paulie. He has so far to go but he wouldn’t be half this good without your help and encouragement.